The next five Google Hangouts on Air will include captivating events for Sage 50 users, consultants and developers that want to address the Sage 50 user base. The first time that I saw Microsoft Power BI, my jaw dropped. It is what business intelligence has been trying to become for 20 years. Truly stunning. 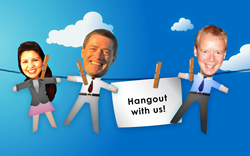 For the Sage 50 customer, partner and developer ecosystem, Suntico has published its March and April schedule for its popular Google Hangouts on Air. The first, on Wednesday 4th March, takes a look at how to get started with MailChimp. A very popular email marketing system for small and medium sized businesses. "MailChimp is a super email marketing system for small and medium sized businesses" says Hugh Johnson, SVP Business Development at Suntico. "MailChimp is very easy to use and Suntico makes it even easier for companies that use Sage 50". On 18th March, in a Hangout on Air for any Sage 50 certified consultant, solution provider or business partner, Suntico will introduce its revamped Suntico Advisor program. On April 1st, Suntico will address the very serious matter of striking the right level of formal procedure around the accounts payable process in a small to medium sized business. Cloud and mobile business app developers can learn on 15th April how they can add another 500,000 businesses that use Sage 50 to their addressable market. In a very special preview event on 29th April, Suntico will show Microsoft Power BI working with Sage 50. "The first time that I saw Microsoft Power BI, my jaw dropped. It is what business intelligence has been trying to become for 20 years. Truly stunning." says Hugh Johnson. It is free to attend any of these events. To add yourself to the Suntico mailing list for future events just go to the Suntico website and register to "Try our demo".